Introduction EMSL Analytical, Inc. recognizes its Minneapolis laboratory for CDC ELITE Certification. EMSL Analytical, Inc. is pleased to announce that its Minneapolis laboratory is now CDC ELITE certified for Legionella analysis. 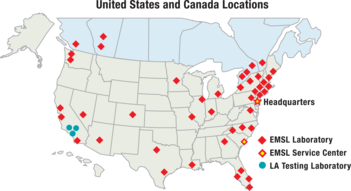 EMSL is the leading Legionella testing laboratory with 20 CDC ELITE proficient locations throughout the United States and Canada. Along with Legionella testing, EMSL Minneapolis offers asbestos, food and beverage, microbiology, indoor air quality and lead testing services. The laboratory is certified by the American Industrial Hygiene Association (AIHA) for fungal testing of air, bulk and surface samples by culture or direct examination through the Environmental Microbiology Laboratory Accreditation Program (EMLAP). EMSL Minneapolis is an AIHA-LAP, LLC Environmental Microbiology Proficiency Analytical Testing (EMPAT) participant for fungi analysis. The laboratory is AIHA-LAP, LLC certified for testing of paint, soil, dust wipes and airborne dust under the Environmental Lead Laboratory Accreditation Program (ELLAP) and Environmental Lead Proficiency Analytical Testing (ELPAT) Program. In addition, EMSL Minneapolis is accredited by the National Voluntary Laboratory Accreditation Program (NVLAP) for bulk and airborne asbestos analysis. The laboratory is accredited by the Minnesota Department of Health and the United States Environmental Protection Agency (EPA) Region 8 for asbestos is drinking water testing. EMSL Minneapolis is certified for phase contrast microscopy (PCM), polarized light microscopy (PLM) and mold analysis by the Minnesota Department of State Health Services. EMSL Minneapolis is also accredited by the American Association for Laboratory Accreditation (A2LA) as an approved food testing laboratory.